This is one of the big benefits of becoming a Go Brick member. When you buy a new vehicle from any Go Auto dealership, you will only have to pay 1% over the invoice price. This means thousands in savings on virtually any one of our 7000+ new vehicles. This is the same deal our own employees get, so believe us when we tell you that we intend to treat our Go Brick members like family. You’ll also receive your invoice upfront, in order to create a convenient, no hassle buying process. That way, there’s no confusion about what you’re saving or how much you’re going to be paying for your vehicle. We tell you what your savings are right away so you can factor this into your buying decision. We’d never expect a customer to buy a vehicle without knowing the final price, and Go Brick members are no different. If you’re ever curious about what your Go Brick price would be on a new vehicle from GoAuto.ca, feel free to contact your personal car buying concierge (this contact information will be provided to you when you become a member). * Land Rover, Jaguar, and Porsche units are exempt, as well as the Nissan GTR and Dodge Viper. Some restrictions apply. No matter the vehicle, no matter the price, Go Brick members automatically save an extra $1,000 off the advertised internet price of any vehicle in our inventory. We have 19 brands and over 4,000 used vehicles to choose from on GoAuto.ca, and you get a deal on every single one of them. No matter the brand, no matter the price of the vehicle. Your deal even applies to vehicles as low as $5000! Not sure what kind of vehicle you’re looking for? No problem. Our 24/7 car buying concierge team can help you price shop, compare vehicles, look for specific features, and more. You will be assigned a Recreational Concierge at the start of the sales process. This specialist will identify your needs and do everything they can to find the perfect unit for your lifestyle and budget. Go Brick members are eligible for all of Go Auto’s great campaigns and promotions. We've given away millions of dollars’ worth of vehicles, paid off people's car loans for them, given away TVs and trips and so much more. There's almost always something going on, so continue to check back at GoAuto.ca. Or you can always contact our 24/7 Happy to Help team at 780-777-7777 (call or text). They'll fill you in on the latest promotions throughout the Go Auto network and enter you into any giveaway you’re eligible for. No matter what service work you’re having done, no matter what parts you’re ordering in, you’ll save 10% off your bill by being a Go Brick member. In addition to these savings, you’ll also enjoy the peace of mind that comes with having your vehicle serviced by certified, factory-trained technicians. These guys will know your vehicle inside and out. In addition to the 10% you’ll save off your bill, you’ll also get 5% of the value of that bill put onto your Go Card that you can use for future service and parts savings. Your Go Card is what entitles you to your 10% savings, as well. And as a Go Card holder you’ll also receive special offers (via email) that regular customers don’t get. Go Auto has three collision repair and body shop centers in Edmonton, and you’re entitled to a 10% discount on services no matter which one you take your vehicle to. 25% off all retail sporting equipment from one of Edmonton’s longest standing, and most popular, hockey and cycling stores. Klondike Cycle has been a staple of the Edmonton hockey and cycling retail scene for more than 40 years. They have a brand new building on Stony Plain Rd. and 170 St. and you’re entitled to 25% off every purchase with your Go Brick membership. So whether it’s sticks, skates, helmets, or pads, you’ll save big, every time. Same goes for bikes, parts, wheels, clothing, car racks, shoes, and more. Note: you must present your Go Card at time of purchase to receive your discount at Klondike Cycle. A $500 Referral Credit will be placed on your Go Card account every time a new customer buys a vehicle using your Referral Code (valid for new & used vehicles, RVs, and boats). The customer who you refer also saves $500 off their purchase! The Go Card is our free customer rewards program, and our gift to you for doing business at any Go Auto dealership. With it, you'll save on every service, parts, and accessories bill, and you can earn big money for every friend you successfully refer to a Go Auto dealership. Every Go Brick card will come with its own unique Referral Code. Give this to friends, family, coworkers, and even strangers on the internet. The more people who have this code the better. When a new customer buys a vehicle at a Go Auto dealership using your Referral Code, you’ll get $500 put onto your Go Card account to use towards service, parts, accessories, or even the cost of a new vehicle. The customer who used your code also saves $500 off the cost of their new vehicle, as well. By signing up to be a Go Brick member, you’ll enjoy all the great benefits below. If you sign up before March 31st you’ll be entered to win a $1,000 gift certificate for Go Insurance! Enter your Brick Employee number below to get started. Exclusive savings on RVs, trailers, and boats. 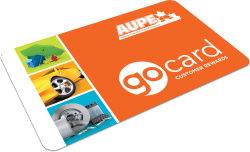 All program sign-ups and vehicle purchases must be completed through Go Auto's Happy to Help department but either filling out the sign-up form or by calling 780-777-7777. Any employees who do not sign up through this process will not be eligible for The Brick Employee Benefits program. Go Auto’s VIP Customer Program for The Brick Employees is available to all Go Brick members in good standing (i.e. current employees of The Brick who have passed their probation period). Certain Vehicles do not qualify for the discounts in the program and they include: all vehicles at Jaguar-Land Rover Edmonton and Porsche Centre Edmonton; Nissan GTRs; all FCA SRT vehicles; Volkswagen Golf R Type Vehicles; and all vehicles with an MSRP over $100,000. This list is updated periodically and will be at the sole discretion of Go Auto. Go Auto reserves the right to add vehicles to this list at any time. Go Card Rewards are not redeemable at Klondike Cycle and Sports Locations. For full Go Card Terms and Conditions, please see any Go Auto Dealership. Go Auto reserves the right to refuse any purchase where a pricing mistake has been made online. All prices must be verified with the Go Auto Dealer.